My dad is a former Navy fighter pilot. That means he not only controlled thousands of pounds of steel moving through the air at impossible speeds and made decisions at speeds faster than this ribbon of steel cutting the air, he also managed to drop that steel onto a postage stamp of a carrier in an empty expanse of water. He fought in a war. That statement, though few in words, is too big for me to completely wrap my head and heart around. I am proud to be his daughter. 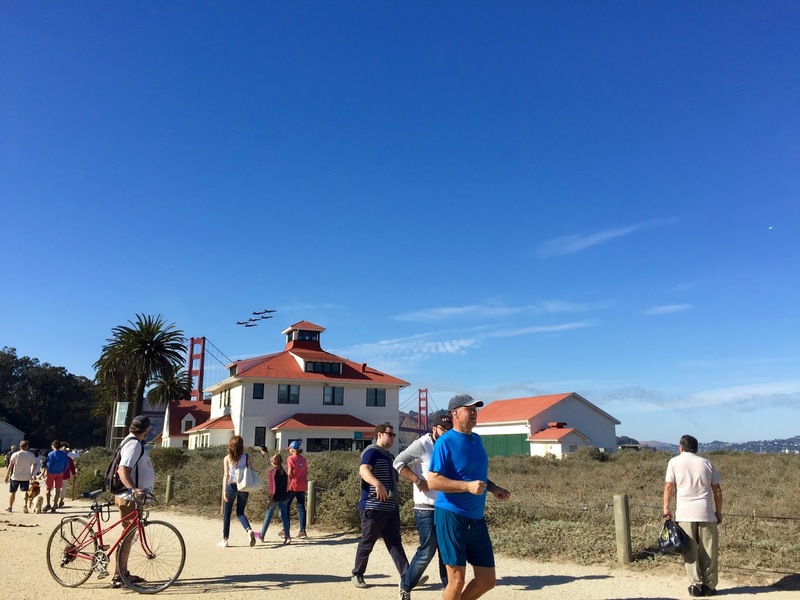 Last week was Fleet Week in San Francisco and the Blue Angels have been slicing open the sky the last few days. On Thursday at work, the first day the jets unzipped our sky, the mid-day quiet of the library opened with a shutter. Startled, I glanced up a my coworker, a San Francisco native. "The Blue Angels," she grinned. "I love that sound." In one of my favorite essays of hers, a chapter in The Writing Life commonly referred to in anthologies as "The Stunt Pilot," Annie Dillard describes the art of the pilot Dave Rahm: "The plane moved every way a line can move, and it controlled three dimensions, so the line carved massive and subtle slits in the air like sculptures. 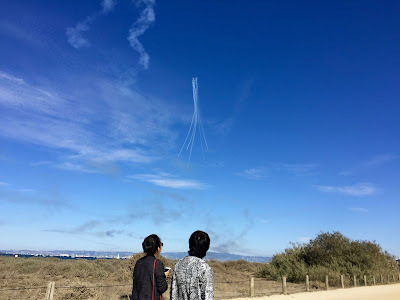 The plane looped the loop, seeming to arc its back like a gymnast; it stalled, dropped, and spun out of it climbing; it spiraled and knifed west on one side's wings and back east on another; it turned cartwheels, which must be physically impossible; it played with its own line like a cat with yarn. How did the pilot know where in the air he was? If he got lost, the ground would swat him." The ground may have swatted at my father. I know other jets certainly did, and missiles did, too. But he made it back, and because he made it back, I exist. 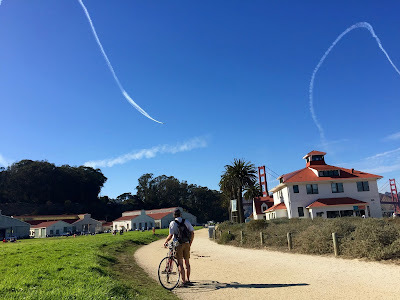 Yesterday, a piercing blue and gold San Francisco day, a good man and I biked from his house to the Presidio where we had a nearly unencumbered view. 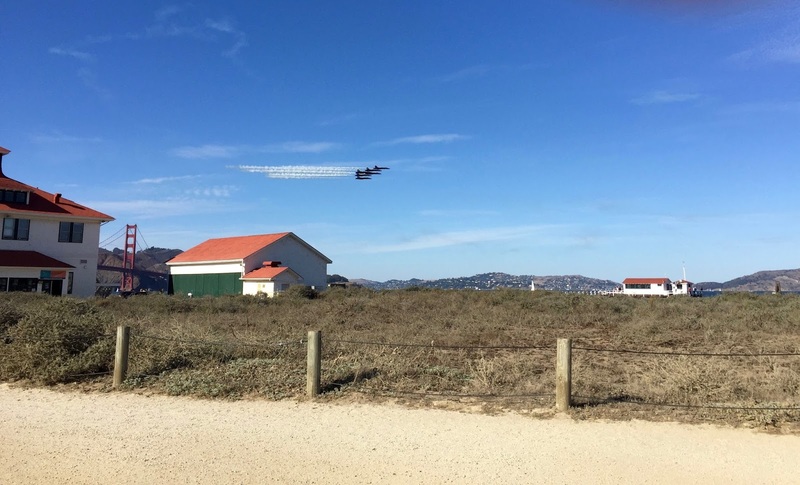 I sat on the grass with this good man and watched the Blue Angels paint the sky. We ate sandwiches and talked and tried to take pictures of planes that moved so quickly. 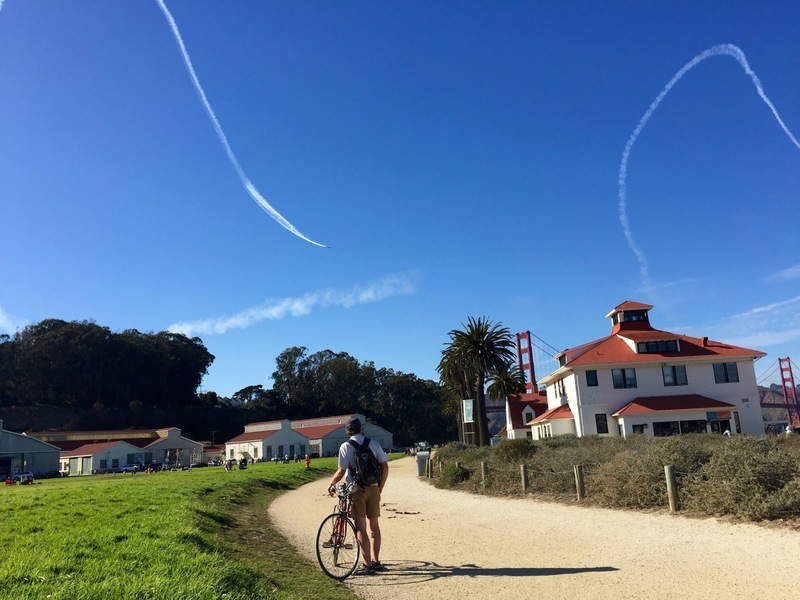 It was a perfect afternoon: San Francisco's October sunshine, the scream of jets, and excellent company. My dad escaped death's paw allowing me to have this day and so many others. I do not take this lightly.